With his debut album, singer-songwriter Diego Davidenko continues searching for a home he never knew, taking listeners on a journey through his own experience living in America with soft, free-flowing acoustic melodies and meaningful, personal lyrics. 3. Lillyann, Where Are You? 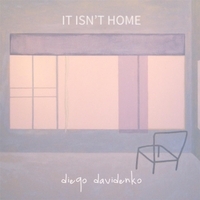 With his debut album, It Isn’t Home, Argentinian American singer-songwriter Diego Davidenko continues searching for a home he never knew. Davidenko takes listeners on a journey through his own experience living in America with soft, free-flowing acoustic melodies and meaningful, personal lyrics. To fully encapsulate his musical goals, Davidenko quotes Yip Harburg, “Words make you think a thought. Music makes you feel a feeling. A song makes you feel a thought.” While he did not set out to center on the concepts of seeking home, connection, and love, these themes consistently find their way into Davidenko's words. In his “painfully passionate” songs (Jennie Webb, Bitter-Lemons) Davidenko draws on desires which are either never found or are discovered to be red herons. This leaves listeners with a sense of longing and isolation, a feeling which Davidenko believes to be a common experience, while serving as a reminder for the lost listener that they are not alone. Born in Argentina, Diego Davidenko moved to America when he was nine years old. Davidenko has lived in music capitals across the country including New York City, and Austin before settling in Los Angeles, CA where he currently resides. Davidenko’s indie-folk sound is heavily influenced by bands such as Bright Eyes and Elliott Smith, as well as the gentleness of Simon and Garfunkel. Although this is his first full length album, Davidenko has been involved in the music scene for over a decade and has earned a Master's in musical composition from Syracuse University.